Check out the brand new exhibits at Clark Planetarium at the Gateway Mall in Salt Lake City, Utah! They’ve spent all year planning these new exhibits and we’re proud to have been a part of that! All together, five new laser projectors were integrated and installed – two NEC projectors, two Sony projectors, and one Epson projector. For one exhibit, two Sony laser projectors (VPL-FHZ57) were used with Sony’s ultra short throw lens to project side by side. Together, they created an interactive exhibit that responds to waving arms. When arms are waved on the left projected image, the right image will show how that movement would change the orbit sequence and how it would effect the Earth’s sky. 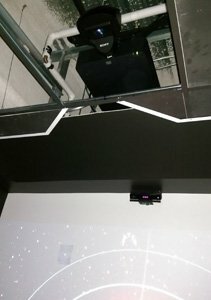 Closeup of Sony’s VPL-FHZ57 laser projector mounted in ceiling with Ultra Short throw lens above the interactive image projected on the left. 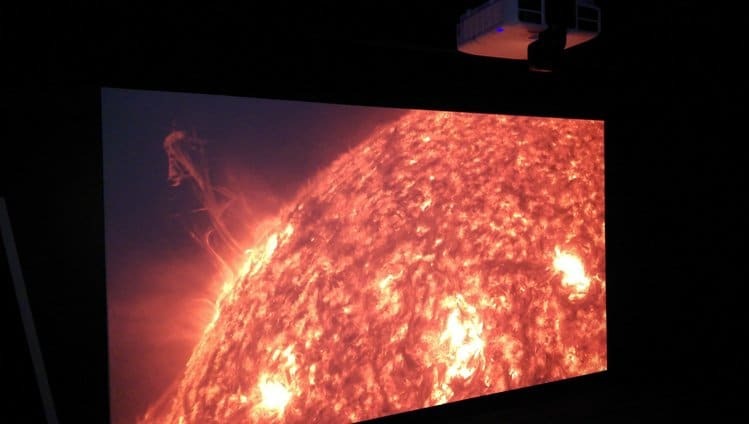 In one exhibit, the Epson Pro L1100UNL laser projector was used to project full HD motion images of the surface of the sun. Together, with the world’s first 0 offset ultra short throw lens, it creates an incredible exhibit! As you can see, the bottom of the projector is the same height as the very top of the projected image (creating the 0 offset). In addition, two NEC laser projectors (NP-P502HL) were used in an additional exhibit about black holes. When the projector grid is stepped upon the grid will distort to show a simulation of a black hole. See all of these new exhibits live! For more information on the Clark Planetarium, visit their website. This entry was posted in AV Solutions, General News and Updates, Installations and tagged 0 offset, clark planetarium, Epson projector, interactive display, interactive projectors, L1100UNL, laser projector, laser projectors, NEC projector, NP-P502HL, planetarium, Sony projector, ultra short throw lens, VPL-FHZ57.